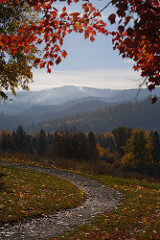 Fall is an amazing time to be in the Flathead Valley. As the summer crowds subside, a sense of peacefulness sweeps over the valley. With yellow Larch needles, orange Mountain Ash berries, and red Maple leaves, the landscape becomes more beautiful with each passing day. The fall activities are endless with some more appealing than in the busy summer months. Hunters hit the National Forest and State Land areas hoping to score a tag and get meat to last their family through the winter. Hiking in Glacier National Park is not only advised due to the hunting season, but is more pleasurable with visitor numbers down. Instead of encountering hundreds on the Avalanche Lake trail, there may only be a couple of dozen hikers on a busy day. Cycling on roads within Glacier also becomes more feasible with less vehicle traffic on the well maintained roads of GNP. Fishing is still great on various lakes and rivers, as well as paddling. The cool crisp air is refreshing and results in rosy cheeks on those partaking in outdoor activities. Early fall brings both black and grizzly bears in town to forage among fruit bearing trees, bird feeders, or improperly stored trash. Anything that can provide much needed calories before entering hibernation is fair game. Often an overnight dusting of snow remains, making it easier to see animal tracks and sign. Turkey and deer numbers are at an all time high in town. With hunters prowling in the woods, these animals and others retreat to town for safety. Due to fewer travelers in the area, accommodation rates drop and many establishments run specials, making it a very affordable time to visit. With low visitor numbers, an abundance of activities, and great prices, fall is by far one of the best times to visit Northwest Montana. St. Patrick’s Day Fun in the Flathead! ABC’s The Bachelor films episode at the Hidden Moose Lodge .